Looney Labs’ Fluxx is always getting new versions coming out for it. The game where “the rules are always changing” is easily reskinned to fit different themes. I’ve personally played 6, not counting the two (and a partial) that are in this review. But rather than just different pictures on the cards, Looney Labs really does try and make the sets act and play differently. Did they succeed with Batman Fluxx and Adventure Time Fluxx? And what about these Fluxx Dice? Well, that’s what we’re here to talk about today. 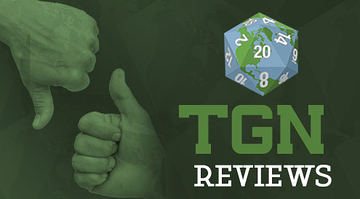 So kick that creeper to the side, it’s time for another TGN Review. This time it’s Batman Fluxx, Adventure Time Fluxx, and Fluxx Dice. We’ll start out with Batman Fluxx (because to hell with alphabetical order). As with all Fluxx games, the rules start with you drawing and then playing a single card. The game is won when someone has the requirements listed on the Goal card (that someone will play at some point). So what makes this version different? Well, like Cthulhu Fluxx and Zombie Fluxx, the deck is rather Creeper-heavy. 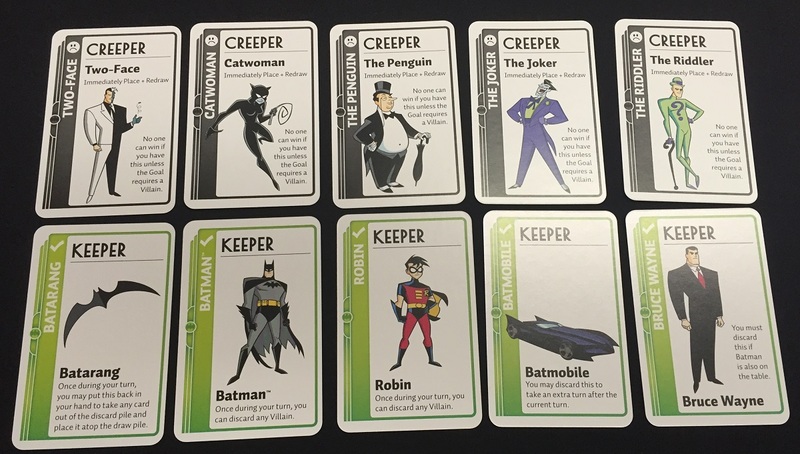 An interesting note about the Creepers in the Batman Fluxx deck is that the rule of “you can’t win when you have this card in front of you” has been modified to “no one can win if you have this unless the Goal requires a Villain.” That means if there’s a Creeper out on the table, nobody’s winning unless the goal very specifically says you need to have a Villain as part of it. So how do you get rid of the Creepers? Well, there are a couple Actions that let you get rid of them (and several that will bring them back out into play), but mostly, there are the various crime-fighting Keepers that you can have in play. Batman, Robin, and Batgirl all let you discard any Villain in play once, each, on your turn. The Batcuffs will also let you hide a Villain underneath them. Several of the other Keepers also give you some sort of bonus. The Batmobile lets you take 2 turns in a row. The Batarang lets you take it back into your hand to put a card from the Discard pile on top of the Draw pile. The Bat-Signal lets you exchange it for Batman from another player. Of course, many of the Goals require some combination of heroes or villains. So just sending all the Creepers right to the Discard pile might not be the best idea. 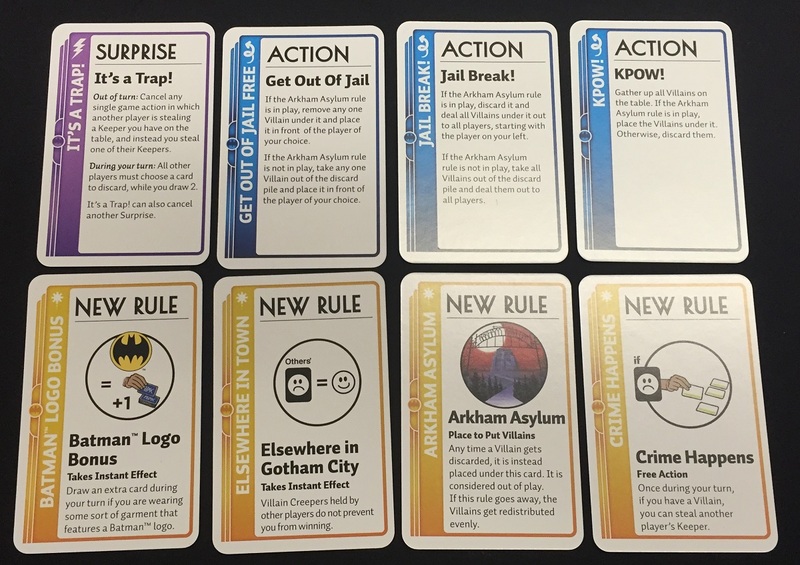 In Batman Fluxx, as opposed to many other Fluxx sets, the Keepers really change something about the game. Several almost feel like “New Rule” cards on top of being Keepers. There’s a level of interaction that is sometimes lacking from other Fluxx sets. This is one thematic reskin that really does play like something new and different from the standard Fluxx game. The Adventure Time Fluxx set is a bit more “traditional” in terms of Fluxx. There are only four Creepers in the deck, and they once more go back to the “You can’t win if this is in front of you unless a Goal says otherwise” rule. All four do allow you to perform some sort of action, though. Either they move around, or they allow you to steal Keepers from other players. Of the 21 Keepers, 6 of them have special rules. The set also has Surprise cards. There’s the four “general” ones that deal with the four types of cards, plus one extra called “I Have a Sword” that keeps an opponent from stealing a Keeper, or lets you discard a Keeper or Creeper from in front of you. Like I mentioned, the Adventure Time Fluxx set feels like the “traditional” style of Fluxx with some cards that go with the theme, but many that are simply reskins of the older cards. That brings us to Fluxx Dice, which is an entirely different thing. Unlike all the other Fluxx expansions which are stand-alone games, Fluxx Dice is simply an add-on accessory. The set comes with two dice and five cards. 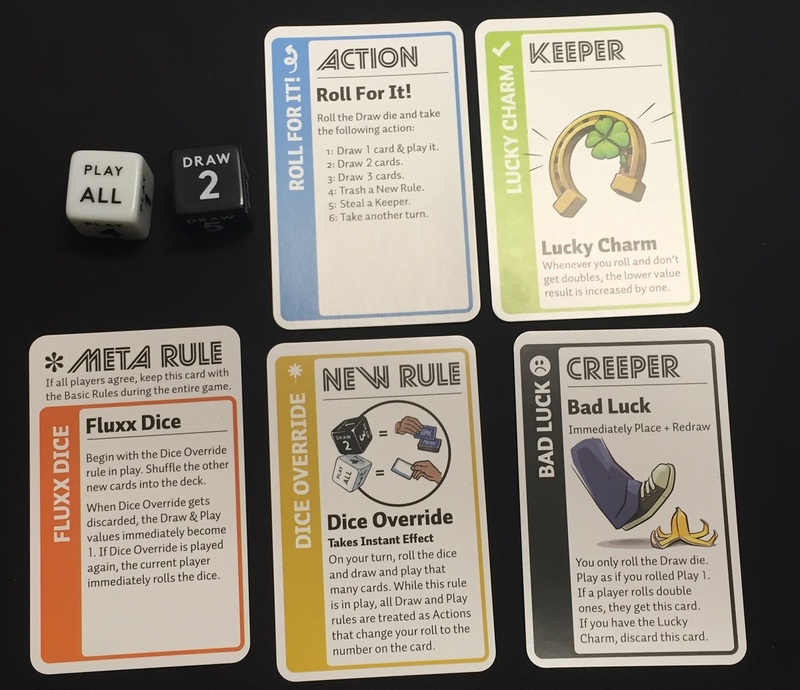 To use the Fluxx Dice, take out the Meta Rule card and Dice Override Rule card and place them next to the Basic Rules card. The other three cards get shuffled into whatever deck you’ve decided to play. The dice represent the Draw and Play totals for your turn. Instead of the New Rule cards that tell you how many cards you draw and play during your turn, you roll the dice. The black die is the Draw die and the white die is the Play die. 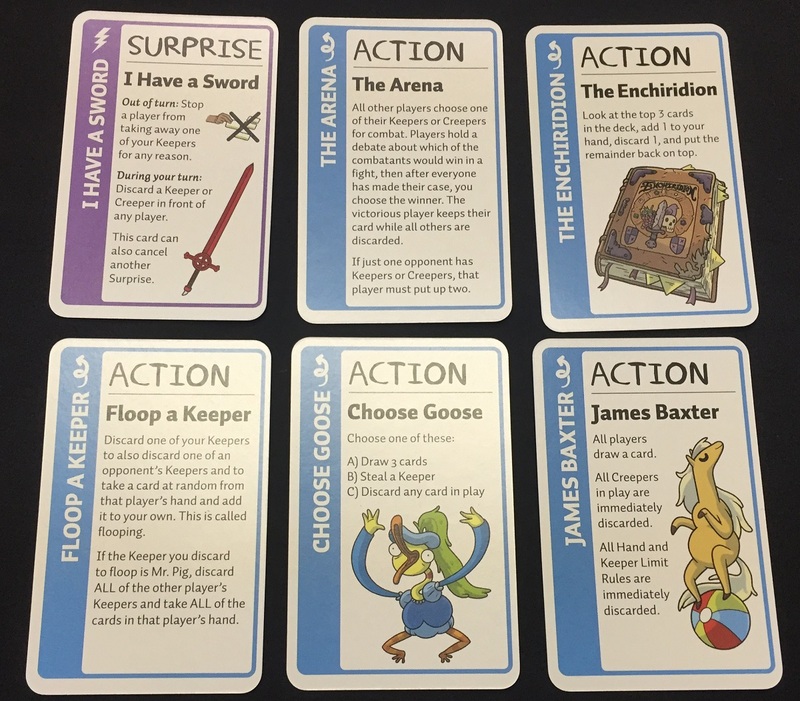 While the Dice Override Rule is in play, all regular Draw and Play Rule cards instead turn into Action cards that will replace what you roll on the dice for your turn. 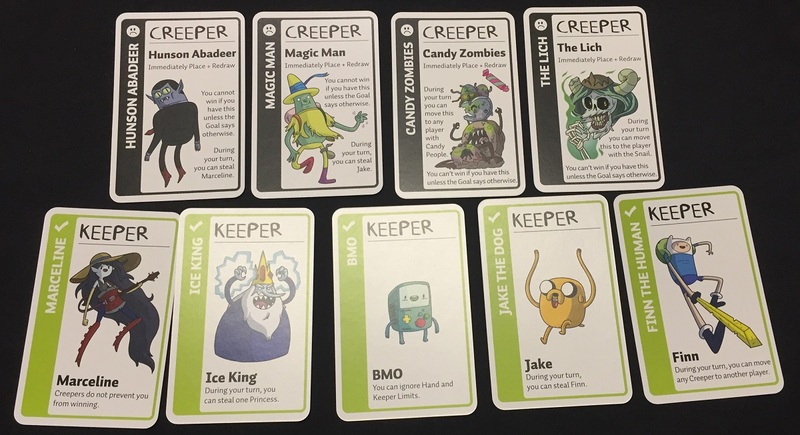 The Keeper, Creeper, and Action cards that come with the Fluxx Dice set give you some sort of interaction with the dice. Note: The Creeper from this set doesn’t say you can’t win with it in front of you. So that’s different than most. The Fluxx Dice set takes the already really random nature of Fluxx and just ramps it up to 11. For those of you that thought Fluxx was too structured, this might be the set for you. So there you have it. Adventure Time Fluxx, Batman Fluxx, and Fluxx Dice. Out of the two sets, Batman Fluxx I think is the "better" one. I like how the Keepers and Creepers interact. With how nobody can win when any of the Creepers is out, it almost becomes a little bit of a cooperative game… almost… kinda. It really feels like a new direction for Fluxx and I really enjoyed it. Not to say that there was anything wrong with Adventure Time Fluxx. I enjoyed it as well. And if you’re a fan of the show, you’ll certainly enjoy the set (I know Spencer here is chomping at the bit to get more time in with it). As for Fluxx Dice, as I mentioned, if you want some extra randomness throw into your games of Fluxx, then it’s a good addition to your collection. If you're a Fluxx Fan, I recommend checking them out over on the Looney Labs website.